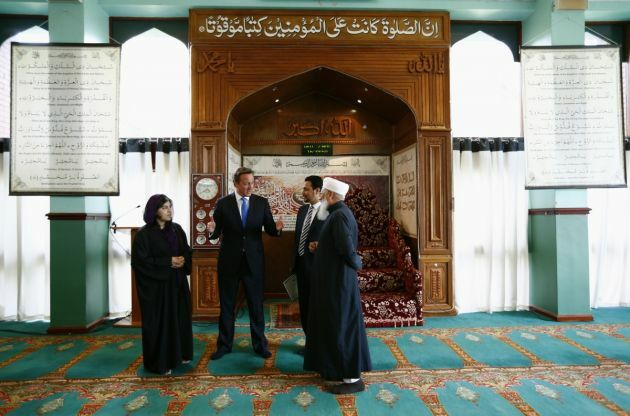 (Photo: REUTERS / Darren Staples)Britain's Prime Minister David Cameron speaks with Chief Iman Allama Qamar-uz-Zaman Azmi (R), Waqar Azmi (2nd R) and Baroness Warsi (L) during a visit to the Jamia Mosque in Manchester, northern England August 7, 2013. With a decreased focus on the lives of Muslims in the Western world in U.S. and European TV, stereotypes and negativity have increased in the news, new research has found. This is according to new research from Media Tenor International, the global media research company, made public Friday. The finding were presented by Media Tenor CEO and founder Roland Schatz at the Alwaleed bin-Talal Center for Muslim-Christian Understanding at Washington's Georgetown University. It was part of the Muslim-Christian Relations in the 21st Century: Challenges and Opportunities conference. "Despite the increasing need for better understanding between people of all religious faiths, overall the news media is not helping to build compassion and tolerance, but, in many cases, is actively working against it," says Schatz. He noted that Media Tenor analyzed more than 430,000 news reports from 2007 to 2013 in recognition of Professor John L. Esposito's tireless work on these issues with the ACMCU. Muslim-Christian Relations in the 21st Century: Challenges and Opportunities is an exploration and critical discussion of the contemporary challenges facing religious pluralism and Muslim-Christian relations. This conference commemorated the 20th anniversary of the Alwaleed bin-Talal Center for Muslim-Christian Understanding (ACMCU). At the conference Baroness Sayeeda Warsi, the United Kingdom's first minister for faith, and first Muslim cabinet minister called for an international response to religious persecution. Tom Farr, director of the Religious Freedom Project at the Berkley Center for Religion, Peace and World Affairs, moderated the event. Warsi spoke on the issue of extremism in Britain and worldwide. "The problem with extremism isn't too much religion, it is too little religion. The people who kill in the name of Allah or whatever god lack a basic understanding of their own faith," Warsi said. "For myself, a Muslim mother, I teach my children to be good people, and then show them that Islam is a good basis for that kind of behavior, but I don't indoctrinate them in the way that some people indoctrinate their children. I want my children to be good people first, and then hopefully good Muslims." Founded in 1993, the center has spent the last two decades building stronger bridges of understanding between the Muslim world and the West, as well as between Islam and Christianity. For more than 20 years Media Tenor's says its mission has been to contribute to objective, diverse and newsworthy news by bringing together the diverse parties who both impact and are affected by the news. Media Tenor's global research projects include analyses of election campaigns, investor relations, public diplomacy, corporate communications and other topics critical to news makers and news audiences.